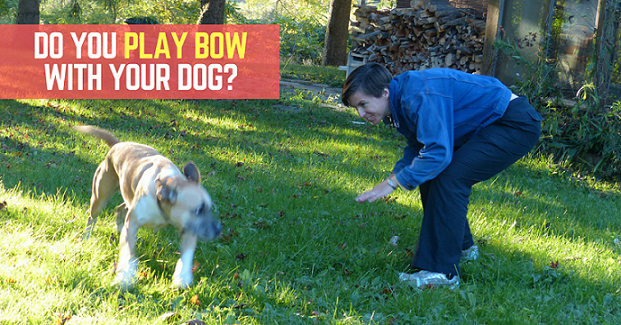 Do You Play Bow With Your Dog? Hiking across the field at the front of our farm, I heard the signature jingle of Baxter’s tags behind me. A few minutes before, he’d dove into the brush between the front field and the east field, sure he’d seen a squirrel or a chipmunk. A year ago, watching my off-leash dog sprint away from me pursuing some creature would have caused me a lot of anxiety. Walking away from him while he was still absorbed in his quest was a bit of a test. Would he remember I existed? He didn’t register my question. In fact, rather than celebrating the squirrel sighting with me, he stopped and investigated an interesting sniff in the weeds. 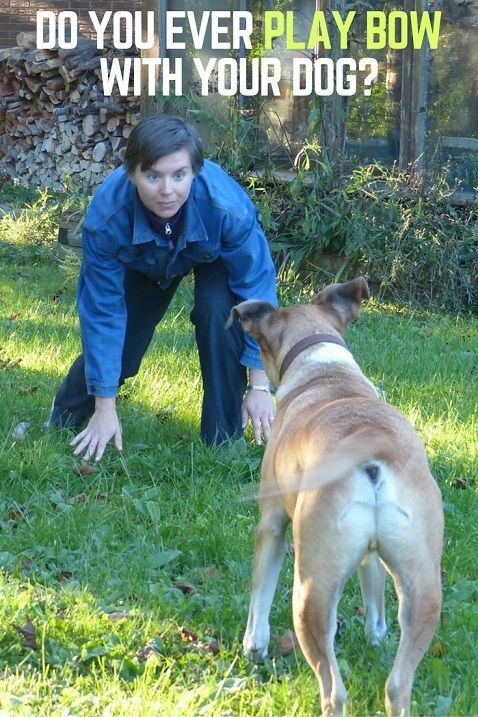 As Baxter resumed walking towards me, I bent down towards him in my best imitation of a play bow. He happily scampered towards me and then we sprinted across the field together, reveling in the excitement of fresh air, fall afternoons, freedom, and—of course—squirrels. The lesson to speak to my dog using body language more than vocal language is one that hit home when I read The Other End of the Leash. Since then, I’ve been practicing my body language—and especially my play bow. I hope that by “playing” with Baxter, he starts to think of me as more fun than squirrels. More articles about what else us humans can do (body language wise) with our dogs would be fascinating to read! It’s amazing how they immediately know what you’re “saying.” Thanks for the suggestion of more body language articles. I’ll keep that in mind for future posts. I do! When my dog clearly wants to play and run around and my other dog is not up for it, I will play bow and “give chase” (which means I take a few steps toward him and he takes off running in great big snorty circles around the yard). It’s the same game he plays with my other dog, who is older and not always into ACTUALLY chasing. But she play bows and barks at him, he runs off and gathers up great speed then comes back to her, she plays bows and barks, and he runs off again. So in her absence I play a similar game with him. And it does seem to work. He gets it, even if the play bow is kind of weird coming from a human. They must think we are so awkward sometimes! Haha. We play very much the same way. It’s all about the zoomies! I play bow with Ace almost every day when we play. Since he’s so laid back, this gets him excited and more playful and he knows I’m goofing around. I’ll also get on my hands and knees and crawl towards him slowly like I’m stalking him and then get up and run the other direction. He chases me. Ridiculous. He loves it! I don’t do this with my younger dog because he doesn’t need any encouragement to play. I try to keep him calm! Aww… I love that you and Ace play together like this. Such a great way to bond. But, yeah, probably not the best idea for Remy yet! I train/compete in agility with 2 dogs and try to use body language more than words, I’m busy trying to breathe and run, not a young person. What types of body language do you use in agility? I read an interesting book recently where they talked about pointing and how dogs are the only species that understands that when humans point it means “go that way” or “look over there.” I can see that being handy in agility–although we’ve not done much agility, so I could be wrong! All the time! Especially with my young dog. He “gets” it. My older dog doesn’t seem to speak dog very well; he never play bowed at all until our puppy taught him. That’s interesting that it took another dog first. And I’m equally interested that he adopted the behaviour himself eventually. Yes! My dog gets extremely excited this way! I love how happy they seem when we play! we dont play bow, the 2 younger girls play bow with themselves. i play touch the paw. i touch one paw and then the other. the middle child goes back and forth then runs around like crazy and comes back for more. the oldest loves to still play, she gets excited and starts running, the youngest does not like this so much but she runs after her sister and they end up running around in circles. Touching paws is something that we do too–mostly when we’re playing inside. Play bows work best where there’s more space to run around! Learning more about play & body language also changed the way I play tug. I remember an older study found that dogs get more joy out of tug if they’re allowed to win once in a while. It keeps them more motivated and eager to play again. I heard that about tug too. Relationships with our dogs are so much about give and take. I have not really studied body language towards dogs but that makes so much sense! In fact, I am just shocked that it has never occurred to me that body language would be so effective in training Blitz. I will definitely put that book on my reading list, or maybe my Christmas wish list!